Progress Thurs 28th Feb 2013. After much effort and in no small part due to the balmy weather p way have managed to reinstate Shottle South turnout on its new alignment ready for this weekends diesel gala- fettling remains to be done so the 8mph restriction remains. VCT have been at work at Idridgehay adding further warmth to our weather with their fires. M1M group - or perhaps M1P group (MK1 Person group ) have been attending to the CK floors. LMSCA have completed all the passenger doors on the BSK though not all fitted to the coach yet. John Allsop coach painting corporation has applied the first top coat on the west side of the SK. DMU group have been involved in a mega shunt to get everything ready for this weekend. Booking office took the first booking for seats in the inspection saloon during the visit of steam. As an aside can I inform people there has been a complaint from Peak oil at Shottle regarding the speed of traffic through their yard. Please remember this is private land over which we have right of access so out of respect for Peak oil please drive at no more than 5mph through their property. Progress Wed 27th Feb 2013. P Way work continues apace at Shottle with the plain line slewed and packed, all the rails in place and plated up and all the screwing down completed except about 15 baseplates. Tomorrow will see this done, stone dropped via the hopper and the turnout packed ready for use on Friday - sailing a bit too close to the wind for comfort but the good weather today has helped a great deal. Rodney at Duffield has been busy repairing the cabin there with new board and vapour barrier - will that be any use on the p way when its raining one wonders. LCC has cleaned the carpets in the pullman FO and SO. FF has been busy at Wirksworth with more paperwork whilst Bob the husband escaped to give us a hand at Shottle. Pullman buffet was open for business along with the booking office which is seeing more action as we approach the operating season. John Allsop and co have made good progress painting the SK with all the west side now in undercoat and 3/4 of the roof painted. Nice to be in the sun for a change. and the Duffield staff contemplated the true nature of insulation. stations have also received their summer 2013 timetable posters. which has had such a bad attack of tin mice. Winter came back with a vengeance today compared to the sunny weather of last weekend. 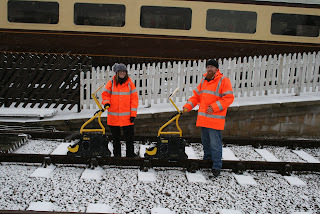 A number of volunteers braved the wind chill and set about a range of tasks down the yard. The early part of the day was taken up by a number of shunts in preparation for Cathryn's planned boiler lift on Tuesday. In the shed Chris and Steve continued the walkway assembly and the 8F group were busy preparing Cathryn for Tuesday. Mike continued to put the finishing touches to the bubble car. A large number of DMU restorers spent the day working on the class 119. A tricky issue with the fire bell challenged the team' s problem solving skills but thanks to their persistence this was successfully resolved. The LMSCA carried on with their work on the CK and young Matt assisted by changing the vacuum pipe. After lunch a number of guards attended a mutual improvement class which focussed on loco hauled stock and the session proved very beneficial. The Pioneer Diesel Group crewed the class 33 to enable the guards to practice their loco coupling skills and grateful thanks to the crew for assisting with further stock shunting. In the training room a number of new recruits undertook their induction programme and we wish them a long and rewarding time with us as volunteers on our railway. Finally, Rodney ably assisted by Gregory and Oscar laid old ballast over the mud in the Duffield Station car park. Well no one took up our offer of free frozen food storage except a couple of East European blokes who wanted to know if we could hang a couple of dozen horse carcasses in our mess freezer for a few weeks but we declined not liking beef burgers etc. Further remodelling at Shottle sees this project moving forward even in the biting conditions. LMSCA continued work on the BSK with M1M group working on the CK. Rodney has been busy trying to fix up the car park at Duffield while the DMU group have been pressure washing Iris, working on the bubble car and giving assistance to John Allsop painting the SK. VCT have been keeping the world warmer with more fires at Idridgehay- pity they can't light a few fires near our job. Back to Arctic weather today for P way after yesterdays summer breeze. However much work has been done on the remodelling of Shottle South today with the turnout dismantled and moved to its new position ready for assembly tomorrow. A lone carriage cleaner has been busy with cleaning at Wirksworth and the booking office has had many enquires regarding charters etc. Rodney has been busy at Duffield- again. Platform builders have this week removed a further 30m of copings, laid 24 feet of coursework, back filled 57 feet with concrete and cleaned and dressed another 30 foot of stone ready for next week. John Allsop has also been busy in the shed with one side of the in traffic SK ready for painting. Brass monkeys have been seen waiting for a delivery of solder from Twiggs- seems some bits have fallen off. Oh, and if you want to save money on electric bring all your frozen food and stash it the mess room at Shottle- should stay fresh for a couple of millenia. Action Team accomplished 24 foot of work amid positively balmy conditions. Class and more tubes were removed from Catherine (*formerly Kathryn). the windows and back in the BSK work was undertaken on the electrics. attended to its holy floor and its leaky windows. well as the staff at Duffield, in to get some potholes filled. did repairs to assorted trolleys. were sanding the cab window woodwork. Our railway was bathed in glorious sunshine today which was a welcomed respite from this week's weather. Iris was substituted for a 2-car DMU set to accommodate a birthday charter on the first Duffield to Wirksworth service and throughout the day we enjoyed an abundance of happy smiling faces as parents and children delighted in the spring weather and the beautiful vistas of the valley. The Pullman Buffet was busy too as the weather brought out many casual visitors to sample its wares. Down the yard the LMSCA attended to the BSK emergency cord vacuum system as well as fitting internal paneling to the BTO. The Pioneer Diesel Group were in attendance undertaking general maintenance on 33035 in preparation for the forthcoming Diesel Weekend and the 8F group continued the dismantling of Catherine with the sidebars and pistons being removed. The DMU team too were in maintenance mode too with various components being oiled and greased on Iris. Work continued at a pace in the guards van of the class 119 also the 'Bubble Car' north end cab ceiling received a coat of paint and Chris started work on erecting a walkway on the east side of the shed. Finally as you will know No. 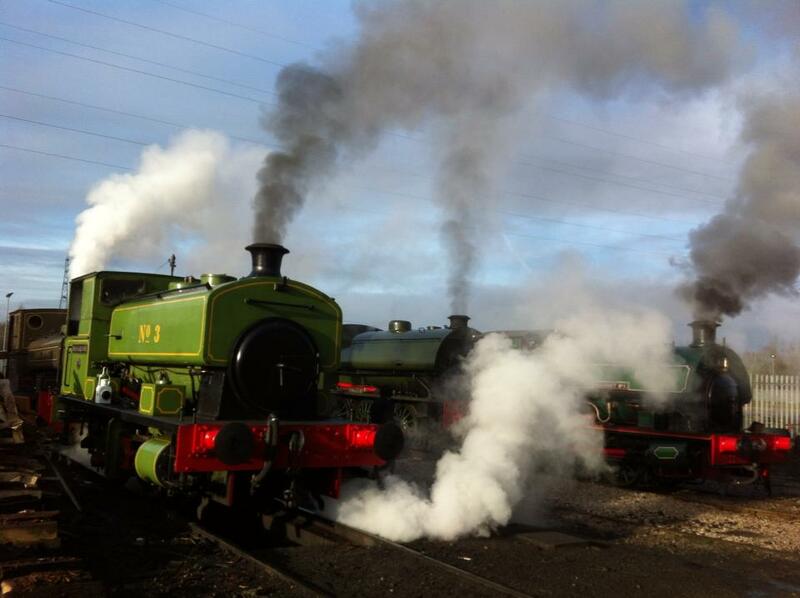 3 made its debut today as a visiting locomotive at the Ribble Steam Railway. I have attached a photo which was sent to me. Baking in todays 8 degrees centigrade pwt made a start dismantling shottle south turnout ready for next weeks repositioning and track slew as well as clearing away more old crossing timbers. Delivery of the first batch of timber for Duffield platform extension was accomplished today and just to indicate how mad our weather is we had lunch today al fresco with the sun out, the birds singing and the cows mooing in the fields although the sheep remained tight lipped as they view us with suspicion. LMSCA continued with the bsk doors- fitting one and getting another ready. M1M working group are now well into finding the faults with the CK but will no doubt overcome. DMU painted the bubble car ceiling again and fuelled various units ready for operation. VCT again out in force south of Idridgehay with several fires returning the CO2 to the atmosphere where, hopefully, it might have some effect on our appalling weather, at least making the summer daily downpour warmer. A much more pleasant day but no doubt the polar bears will return shortly. SMT - Structure Maintenance Team - when we can find some members! Hope that helps and please be aware that my office lap top seems to have had a terminal failure which may affect reponses to emails for a while. Progress Wed 13th Feb 2013. Getting set up to do a job on a 9 mile railway can sometimes take on gargantuan proportions with most of yesterday afternoon spent fuelling up the works train loco, the komatsu, the landrover , getting the correct equipment fitted to the komatsu and a general shunt to get the ensemble in the correct order for a trip to Duffield. With all this done the day before it still takes a good hour and 20 minutes to get the whole bag of tricks to the work site- with komatsu doing 8 to 10 miles an hour and a stop off at Shottle to pick up further items it was 10.30 before we landed at Duffield. All this was in aid of the platform extension which required the general dump of various concrete items and other bric a brac removing from site- 2 wagon loads in fact. By the time we had loaded the pallets- thanks to Rodney for filling them- and the rest of the loose material we had the arrival of todays weather forcast in the form of yet more snow. The stalwarts of the p way are made of stern stuff completing the work and tripping the whole lot to Shottle through a blizzard amid cries of " I want to go home " and " well perhaps more tea first ". A quick departure to Wirksworth allowed us to escape by 2.45 and although my journey home required a detour of 20 miles to escape Cromford hill I hope everybody else managed a more direct route home. Many thanks to all who turned out today which proves beyond doubt we all need assessment regarding our mental health. Equally mad platform builders were out in reasonable force but owing to the appalling conditions limited themselves to sorting out stone for further work next week when conditions might be a tad more favourable. Most people wouldn't work in these conditions for pay never mind as volunteers and it is because of this commitment by these people that the Railway always, in the end, achieves its objectives. gear of Kathryn, and fitting a second lubricator to Henry Ellison. carriage is coming along wonderfully well. A busy day today with a number of parents taking advantage of our children travel free promotion. The Pullman Buffet did a brisk trade and it was good to see many of our younger visitors spending time in the model railway. Down the yard the LMSCA members were working on two projects; one group were fitting windows in he BTO with the second group concentrating on BSK door replacement. The 8F group were busy removing Catherine's rear springs and splitting the right piston crosshead in preparation for lifting the boiler. Finally, the DMU team worked in three groups; Group one replaced worn fan belts and vacuum pipes on the 'Bubble Car', group two concentrated on finishing the installation of the standard class seating in the class 119 with the third group concentrating on removing exterior rust in the gutters and guard's compartment. Progress Thurs 7th Feb 2013. A shunt first thing to get No 3 onto the road/rail loading point ready for its journey to the Ribble steam railway on hire there for a weekend occupied p way for a while whilst material was gathered together for surveying work at milepost 139. Here, at some time in the past during BR days a farm access under bridge was replaced with a later design concrete deck which because the headroom under the bridge had to remain the same required the track level to be lifted some 2 feet. BR achieved this by grading out the increase in track level either side of the bridge some 300 metres which is fine but with a couple of feet of new ballast under the track at the deepest point meant some settlement was inevitable and with no repacking by BR by now the the incorrect levels have become a cause for concern and require rectification in the near future. Surveying the levels at this point reveals a maximum lift on the high rail ( forgot to mention its on a curve )of 127mm and the low rail a maximum lift of about 150mm as the cant is incorrect as well. This will consume about 50 - 60 tons of ballast and will take several days to carry out during late March. The first material for the Duffield platform extension has been ordered for delivery next week. DMU team were in attendance and carried out a "B" exam (service for non railway types)on the bubble car which also had its passenger compartment ceiling repainted. LMSCA carried on with the never ending BSK renovation. The CK coach was also worked on by EVRA types and we could do with a short and to the point name for this gang (remember we are a family organisation). VCT as usual were chopping their way through the undergrowth at Idridgehay with enough chopped down material to occupy 2 fires. Messers Newby checked out a couple of heaters in the buffet and duly confirmed they were deceased - new ones required. Booking office has now confirmed the arrival of ex Lancashire and Yorkshire 060 goods tender engine to our railway for the last couple of weeks in July and all August so bookings are now being taken for seats in the first class coach and places in the exclusive double ended saloon - details are on the EVRA web site at www.E-V-R .com Your chance to see and ride behind a pre grouping loco on the Wirksworth branch in BR black livery sporting all maroon coaching stock- a site not seen for many years. Don't miss it- you know what they say - only regret the things you didn't do. Progress Wed 6th Feb 2013. Another fun day for p way in the balmy conditions of 5 centigrade with a wind chill of 0 centigrade but without rain or snow no less allowed us to get some work done after being spoilt to death working in the shed yesterday. 30 tons of gloop were dug out of the ditch at bridge 20, a job needing doing for a while which will prevent the track flooding at the next heavy down pour. Unfortunately, the wagon used to transport said gloop is, well, rather, lets say less than pristine and one hopes for rain in the near future before anybody from EVRA sees it - it being their wagon and all. Further activities included moving material around for platform builders and removing more copings. Transporter bogies belonging to the 8F group were recovered from Shottle to rest Cathryns frames on when dismantled in the near future and 2 more wagons of logs were loaded for resale. Martin entertained further testing customers who were looking at our facilities with a view to crossing our palms with silver. A lone carriage cleaner was hard at it in the DMUs.- cleaning of course. Platform builders missed out on a mention yesterday but to put matters right have completed 50 feet of walling and 60 feet of concrete backfill over the last 2 days. Rodney has also been hard at work at Duffield stacking the material north of the platform on pallets ready for transporting away to clear the site ready for the platform extension work beginning soon. Booking office was busy booking people onto our steam events this year. Only 52 days before the clocks go forward and 52 days before you have to pay your increased water bill - every silver lining has a cloud. A bleak, cold day with blizzard conditions at the Wirksworth end and sunshine further south. Our team of Patrick, Richard and Eric turned out to host a couple of school charters. Health & Safety defeated our visitors from Alfreton but Elton school managed the journey to Wirksworth and journeyed to and from Duffield. They were noted as a well behaved and interested party. VCT were in action in the area of Milepost 134 3/4 south of Hazelwood with 40 yards of the Up (east) side of the line cleansed and the brash burnt on one very large fire by the five members of the team present today. The dmu team continued to tidy up the "Bubble Car" after its repaint, made more progress with the Class 119 car and helped with the preparation and disposal of Iris that had formed the charter train. The PWT realigned the east side track within the Maintenance Facility to allow an easier access for carriage painting and prepare for the planned concreting of the interior floor. The LMSCA were out in force manufacturing window frames for the Brake Third Open, electrics within the Mark 1 BSK and preparing woodwork for the BTO. They also thanked Rodney for his efforts to improve the steps down to their working area and the walkway used to access their vehicles. Eric also expressed thanks for all those that had donated material for the Model Railway display which will allow it to reopen again this Saturday and be fully functioning by Easter. The DST conducted further testing of No3 before it departs at the end of the week for a short visit to the Ribble Steam Railway. Another landmark for our enterprise and a first hire of a Wirksworth based locomotive to another railway. Doug oiled up the axle boxes of the newly arrived CK (Corridor Composite) dealing with another essential part of its resurrection and return to service after many years of idleness. The Pullman Buffet Car had quite a productive day given the miserable weather. Well, we were quite, quite exhausted: what a day of extreme busyness. of the interminable to-do list. you his list. This group will operate on Thursdays and Sundays. for our various carriages from a railway in the vicinity of Lydney. trolley, after having sanded his wood to a deeply impressive finish. A very busy day down at Derbyshire's favourite branch line. Our scheduled Duffield service attracted a number of younger passengers today who enjoyed the added bonus of watching number 3 steam up and down the incline as it completed routine tests before its immenent departure to the Ribble Steam Railway Gala. Down the yard the LMSCA continued their restoration work. The DMU team were out in force working on the class 119. They welcomed Andy Fowler, Heritage Railways Editor of Railway Herald who is keen to publish a news feature on their work. On the restoration theme he also took the opportunity to spend time with the steam team and LMSCA who will also feature in a forthcoming article. We also welcomed visitors from the Furness Railway Trust, Worth Valley Railway and Ribble Steam Railway. I would draw your attention to the announcement on our website regarding the Furness Railway Trust's steam locomotive Collett 0-6-2T no. 5643 which will be joining us for a few weeks in May from our colleagues at the Ribble Steam Railway.